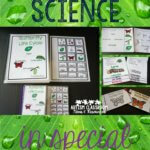 One of my earliest products were my functional sight word task cards and they are part of many of my larger bundles in my store. I looked at them the other day and they seemed a little worn. And of course once I got started, of course it became a total redo of the whole set. And then it got complicated because these little packs were part of several bundles and my recreation turned them from 3 individual products to 2. 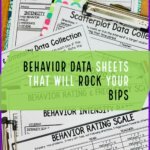 So I wanted to share what the revision means for all of you (and then I can focus on the original purpose of my post which was a freebie roundup for holiday activities to keep you going through these last weeks before vacation). 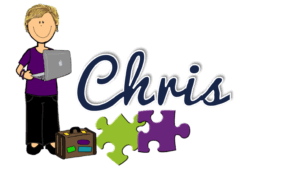 Many of you may have purchased my Read the Signs Functional Reading Task Cards….if you downloaded it by itself, go download the update from My Purchases. The signs are updated with some additional signs (handicapped access, information, trash, No Dogs Allowed, Hiking Trail, and Wet Floor. I removed Railroad Crossing, phone, and hot/cold because they didn’t seem as relevant as the ones I added. This also added 10 cards to the set; there are now 70 task cards in the set and if you have purchased it (or received it as a freebie through my milestone last year), you get it for free. 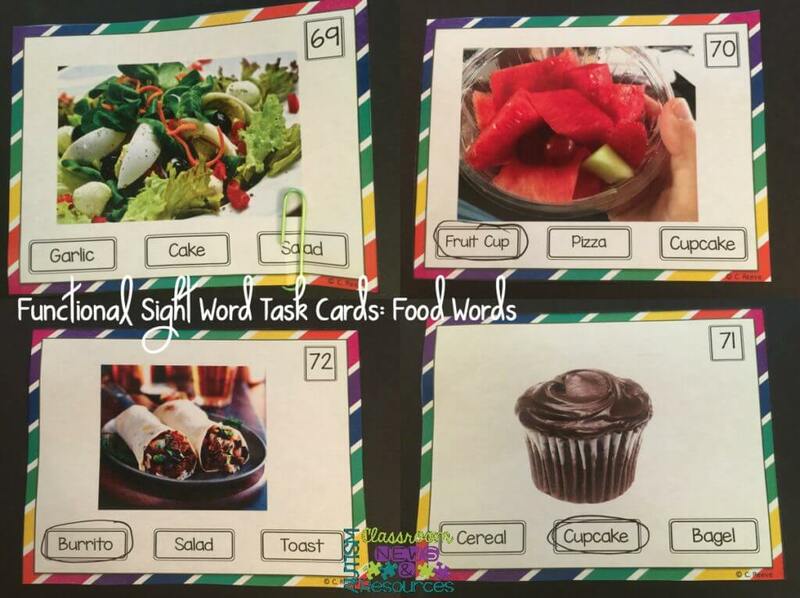 Then, I combined the food reading task cards so that there is 1 product with all food words (menus/restaurants and grocery words) and all of the cards have real photos of the food items. There are 120 (equal to the 2 packs of 60 each), but there a wider variety of words and again, the words are brought a bit more up to date. This is posted as a new product; it just made more sense to combine all the words rather than separating them. Consequently it can’t be downloaded as an update by itself. For anyone who bought just the Take Away Words and Grocery Words, check out the bundle option below. You still have the old cards available but the old products are inactive. I’m excited about the new pack because they look so much more enticing. Click the picture to the left or below to check them out. If you had previously purchased the bundle of the three products (take away words, grocery words, and signs), you can now download the updated bundle for free. 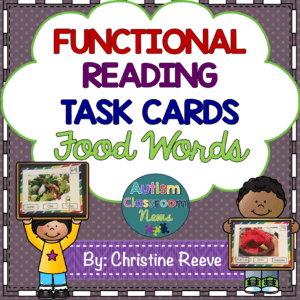 It has the new Read the Signs and the new Food Words cards so it has 10 more cards than it previously had and the food words are all pictures. And since it wasn’t active during the sale when I was working on it, I am putting it on sale for 20% off through Sunday at midnight Eastern. Then it goes up to its new price. This is a mega bundle that has my money, next dollar and functional reading activities in it as well as a structured work system starter kit to get set up. 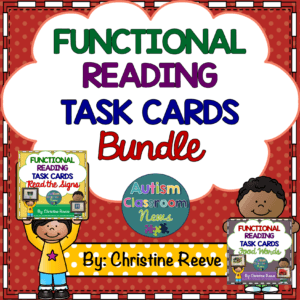 I’ve updated this bundle with the new reading task cards too. It is also on sale through Sunday (12/13) at midnight eastern at 20% off. 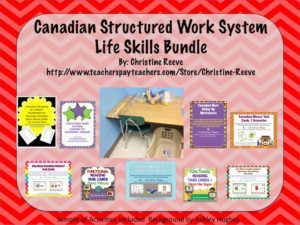 This is a bundle with Canadian money tasks (not all from the one above are included) and functional reading task cards as well as a structured work system starter kit. This one has also been updated and is also on sale this weekend. Those of you who followed the blog last year may remember the countdown to vacation where I gave away a freebie a day for the last 8 days of school. Those freebies are still available so I wanted to make sure you knew about them and where to find them if you didn’t catch them the first time. 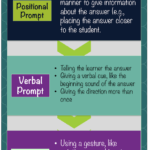 If you are more recent to the blog, you might remember my Back to School social narrative. 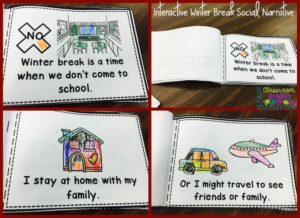 That project began with a mini color book social narrative for the winter holidays. I updated it last week so it is ready for this year (2015-2016) with updated calendars. 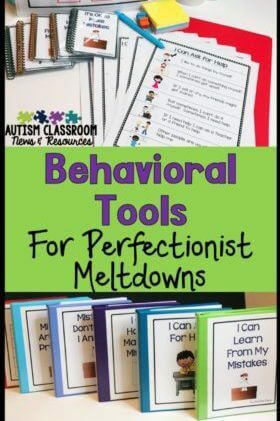 You can read more about it here and you can download it for free in my TPT store HERE. The next one is also in my store. In the spirit of who’s got time to prep, this one is a print and the kids do the work to color it. It focuses on symbols of Hanukkah and Christmas and there are 2 versions. One has cues for the directions and the other does not. See more about it in this post and download it for free in my store. This one is just a simple matching patterns file folder. I wanted something easy for the kids to do to calm down some of the holiday mayhem. Read more about it and download it from this post. 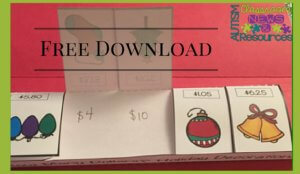 Another print and go activity that practices patterning with snowflakes and can be used after the holidays as well. Read more about it and download it here. Just a simple file folder for sorting Christmas from Hanukkah symbols with a guide for the pictures. Click the picture to read the post and get the free download. If you have my Economics of Shopping products you have similar products. 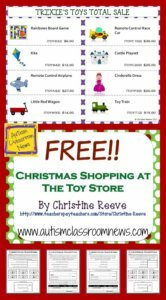 This one is a completely different set of activities for free focused on toy shopping. Click the picture to read the post and get the free download. This one is available in my store. 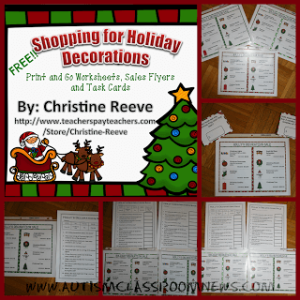 Click the picture to read about it in the post and get the link to the freebie in my store. Then print and go! You may have read about this one in the last Workbasket Wednesday post. Click the picture to check it out and download it. I mentioned this one recently and many have found it in my store, but I didn’t want you to miss it. Click the picture to get to it in my store. I also will be updating my Resolutions freebie for the new year…just haven’t gotten to it yet…so stay tuned. Hope this can keep you going through these last days of school before the holidays!